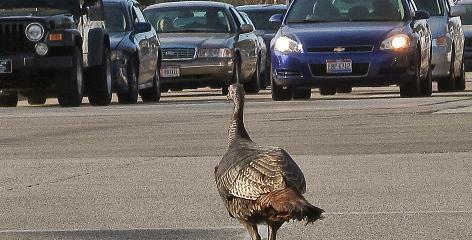 I have seen wild turkeys in different locations for the last two days. Even more turkeys can be seen after a frost lowers the weeds around the wood lots. Three of the turkeys just "strolled" across the road. Thankfully, there was no traffic to be held up like in this picture in Cleveland. My granddaughter, Jessica, and I once counted about 25 turkeys about a block from the families lakeside camp. One of the township fathers told of counting over 300 in a flock on the other side of the lake. On our way to Dayton and the college graduation of granddaughter, Jillian, Mark hit a gobbler who flew into the side of Mary Kay's van. It sounded like a major crash. Mary Kay said "Mark, you killed that poor turkey". Offended, Mark assured her that the turkey committed suicide. I was surprised that no damage was done to the van. Forty years ago there were 3,000 turkeys, statewide. In 2008 there was an astounding 260,00 in the Buckeye State. 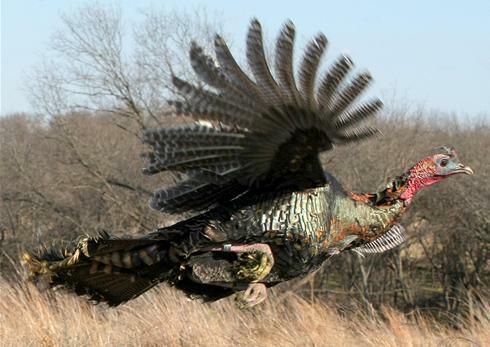 Turkey hunting is the only type of hunting that is growing in popularity. Enjoying our second cup of coffee one early morning a while back, Julie and I watched as a doe and two fawns worked their way down the lakeside road brousing their way along. A car came along and they "disappeared" immediately into the woods. We have a saying in the Pierce Family. It is that the one who tells the last story tells the "biggest..." When I shared this story, or one like it, with my cousin, Cheryl, she told me she saw SEVEN deer in her yard that morning. UMMM! Not far from the 1600 era cabin where this picture was taken of Cheryl, Julie and I, I watched as a small herd of deer worked their way out of the woods to a nearby pond. The main road to Knox Lake, were we are located, is a narrow, two lane road. We refer to it as the ROLLER COASTER. It crosses short, steep hills, one after another. The hills are so steep that you lose sight of the road as you crest the hill. I drive about 30 or 40 MPH tops. I hate it when some hot rod--who probably has someplace to go--tail gates me on this road. I was reminded of the reason for driving slow last weekend. I topped the hill just as a doe stepped out of the brush and calmly crossed the road about 25 yards beyond the hill crest. In the hour, 15 minute drive down I71 from home I can depend upon seeing many, many dead deer on the road. Julie, bless her heart, has had two collisions with deer. In the first she was driving my recently purchased truck. She called and was shook up badly. Again, working in a new operation her company was starting up in southern Ohio, she was in stop-n-go traffic in a friend's car when a deer ran out between cars in a large car lot and ran right into he side of her stopped car. THAT REALLY SHOOK HER UP! The friend, Renee Martin, was as gracious about her car as I trust I was with my new truck. There were 260,000 white tails harvested last year in Ohio. The estimated population is 400,00. While the percentage of the total harvestedis high, the deer have no predators except man. The population recovers to the extend that in some areas professional hunters are engaged to reduce the numbers. I've never hunted deer or turkey. I haven't hunted at all for years. I used to love squirrel hunting but don't think I could shoot a bushy tail today. JULIE SAYS I'M GETTING MELLOW". Ummm! My nephew, Jimmy Pierce, gave me a wild turkey breast a couple years ago but I could not get down to pick it up. My good friend, Don Wilson, supplies me with some Venison. Glad to know I get my storytelling ability honestly! ;) I am beginning to think there are more Pierce genes in me than one could ever imagine.